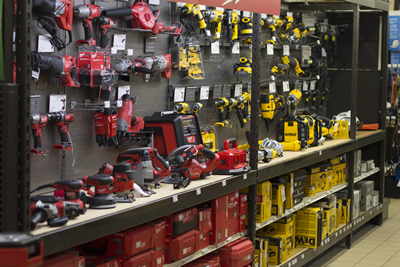 Home Central building supplies store has The Power Tool or Hand Tool you need for your home improvement projects! Whether you are a contractor or a homeowner, we have tools for every project. From the tiniest screwdriver to a powerful air nailer, you can find the right tools for the job and accessories to go with them right here at Home Central. Every task is simpler when you have the perfect tool for the job and our knowledgeable sales team can help you find what you need. Have a question about proper usage, or need to find the right bit for a certain application? Our team has years of construction and remodeling experience and they can answer all of your questions and suggest the products you need. Beside major power tools, we also carry a wide selection of hand tools for woodworkers and DIY enthusiasts. From hacksaws to chisels, we have tools galore! From traditional tools to the newest high-tech inventions, our purchasers pay attention to what you need and make sure they are priced right. When you have lots of tools you need a way to store and organize them too and we have storage solutions for every tool. From bags to bucket organizers, tool caddies to cases, or holsters and belts, we have a system to keep you organized and your tools protected. Don’t forget we carry lots of safety equipment too! Drills, drivers, sanders and circular saws. Air compressors, flooring, roofing and cap nailers. Compound miter saws, drill presses, jig saws and reciprocating saws. Hammers, pliers, snips and screwdrivers. Sockets, wrenches, taps, dies and extractors. Torches, welding supplies, safety gear and tool boxes. Wrecking and pry bars, demo blades, diamond blades, grinding wheels and buffers. Masonry bits, titanium bits, driver bits and extensions. Vises, clamps, planers and chisels. Tool boxes, bags, cases and caddies. Safety goggles and glasses, ear plugs and muffs, hardhats, safety vests and harnesses.